The paleo diet can aid women with weight loss issues, PMS, menstrual cramps, ovarian cysts problems as well as mood disorders. Aug. 18, 2014 - PRLog -- Women's striving to be healthy is nothing new. Obesity in women, despite individual efforts, is increasing at an alarming rate. In fact, over one-third of Americans are considered obese. It is no wonder one of the most lucrative businesses revolve around weight loss and dieting. There are always new diet discoveries, fad diets that come and go and some diets that make good sense and stick around. One of the more popular diets hitting the scene is the Paleo diet. This diet is founded upon the fundamental premise that not every food that can be eaten should be eaten. It should also be noted, the Paleo diet is not just a diet, it is a lifestyle. What we have learned is that the typical modern Western diet has changed over time. Unfortunately, so has our lifestyle. As human beings, we are typically less active and more dormant. Our metabolism has shifted and our exercise level has deteriorated for men and women. It should be pointed out that over fifty percent of our calories come from flour, sugar, corn, soybean and various vegetable oils. It has been documented that if our lifestyles do not change, our children of today will live shorter lives than we do now if this trend continues. 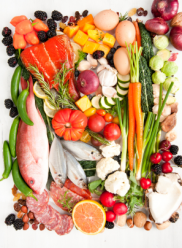 What does the Paleo diet strive to do? It tries to go back and approximate the authentic diet of mankind prior to the advent of the agricultural revolution roughly ten-thousand years ago. The diet, often referred to as the hunter-gatherer diet, is composed primarily of meat, vegetables, fruit, berries and nuts. It is sometimes referred to as the cave man diet. Women who choose the Paleo lifestyle eliminate most, if not all, grains, dairy, beans, legumes, processed vegetable oils, sugars, potatoes, tomatoes, eggplant and other nightshade plants. It is a rather drastic lifestyle change but with very legitimate and documented health benefits. The goal is to return to a diet and lifestyle that more closely matches our bodies and lifestyles of today. The health benefits to doing this by reversing the epidemic of metabolic and cardiovascular disease alone will save millions of live and trillions of dollars. Though lost of the leaders in the Paleo movement have been men, the Paleo diet may be the best diet of women as well. Why? The Paleo diet eliminates soy. When consumed, soy increases estrogen in the bloodstream. Excess estrogen can cause weight gain, PMS, menstrual cramps, ovarian cysts, and mood disorders. The diet also eliminates sugar, which is highly addictive, and the easiest food to overeat. This also causes weight gain, cramps, PMS, cysts and mood swings. It stimulates testosterone production in the ovaries, which is responsible for decreased libido, causes acne and may result in male pattern hair growth or loss. Grain products such as bread, pasta and cereal may be the hardest food to give up. Grains play a role in causing leaky gut, which is the underlying condition that gives rise to autoimmune diseases. Diseases like rheumatoid arthritis and osteoporosis can also be the result of eating grains. We could go on and on pointing out benefits of the Paleo diet. This is by no means a comprehensive article on the subject. We tried to do a brief introduction to a diet that appears to have merit in spite of what seems to be a rather radical approach to its health benefits. But it is definitely worth looking into.